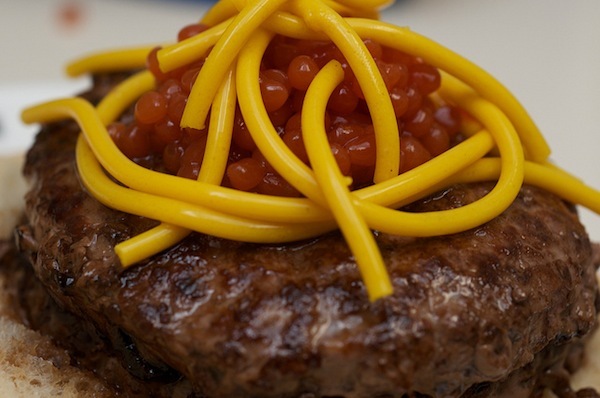 A while back, I watched the No Reservations episode filmed surrounding the final days of el Bulli; the Catalonian restaurant often called the best in the world. Since then, in the back of my mind, I've known that food can be more interesting than we usually make it, through the introduction of chemistry! Those who know me probably realize that the passion and culture of the food (which drove el Bulli) wouldn't be nearly as exciting to me as the application of science — not the most noble reasoning, and certainly not the takeaway anyone involved in that episode intended, but still very exciting from my perspective! I left that knowledge alone for a while, moved out here, and became extremely lazy about cooking. Recently, though, I decided I'd play with some of the basic techniques of molecular gastronomy, just to see how it worked. After some trouble I managed to acquire a supply of basic ingredients — after all, they're not the kinds of things you can easily find in an ordinary grocery store. I'm beginning with just the simplest techniques first, attempting to learn separate components before combining them into anything actually interesting. I imagine what I've managed so far might appear more boring than normal food, from the outside, but the possibilities are what excite me! In fact, I've tried just two techniques so far, out of the many yet invented — the simplest: spherification and gelification, and only in their most basic forms. 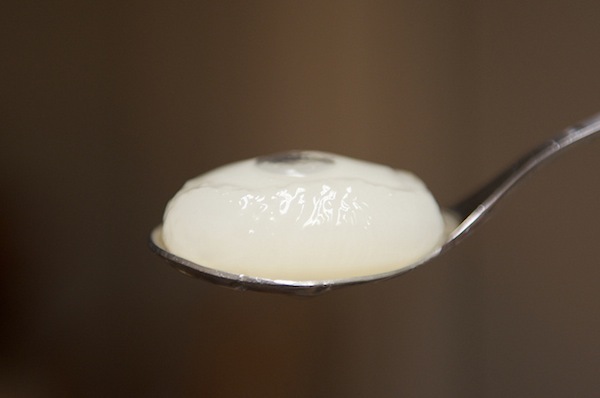 Spherification involves constructing a skin around a liquid, using calcium lactate and sodium alginate. The target liquid is combined with calcium lactate, then frozen in small spherical portions. I chose lemonade simply because it was on hand, and seemed like a reasonable liquid to have "exploding" in your mouth. Next, the sodium alginate is dissolved in water, to make the spherification bath. While the spheres are freezing, the bath is refrigerated. Once the spheres are completely frozen, they are removed from their molds, and dropped into the bath. After a few minutes, they are removed from the bath and washed in water, to prevent further growth of the skin. I left my spheres in the sodium alginate bath for too long; the skin was slightly thicker than I'd have liked. My understanding is that the reaction that creates the skin continues until it's removed from the bath and washed. The skin of my spheres was not particularly smooth. I believe that a rounder and smoother mold might have helped with this. 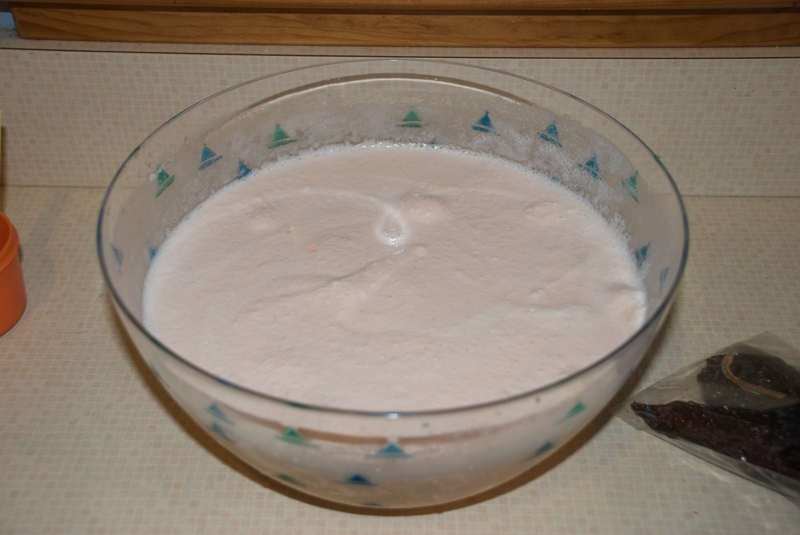 Also, I didn't have a powered hand mixer to combine the sodium alginate and water; a more well-mixed bath might have helped in the smoothness department. There were air pockets in all of my spheres! They floated in the sodium alginate bath; I need to find a way to suspend them deeper without impacting their shape. My spheres were a bit too big. Luckily, there's an easy solution to this! 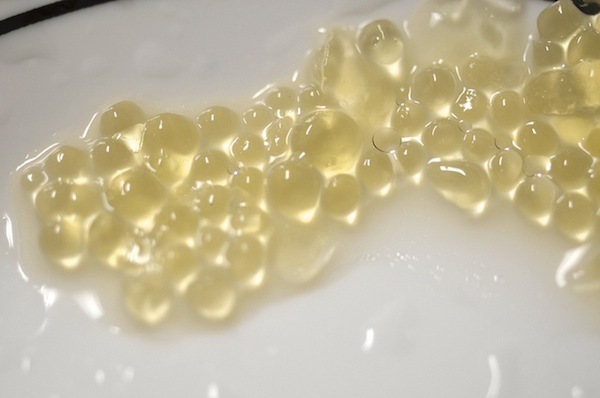 While both gelification and spherification are often used to make spheres, there's one key difference: gelification involves turning the entire material into a gel! Agar is the key ingredient in this process; the same algae-derived material used to keep microbes happy on petri dishes! Conveniently, gelification is extremely simple; a target liquid is heated to boiling, and usually watered down somewhat. Agar is added, in its powdered form, and mixed in thoroughly. 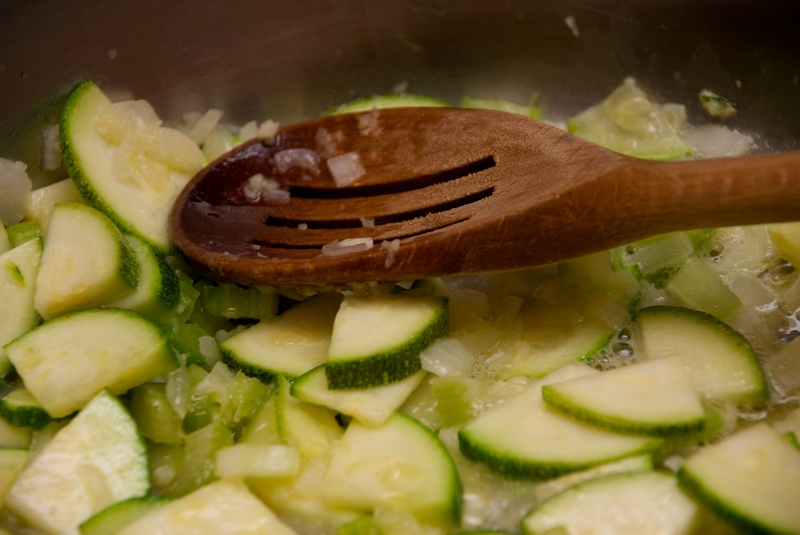 This mixture is then shaped as desired, and then cooled; agar is a liquid above 85°C, so the cooling process is the key to bringing it back into its solid state. Once the supply of boiling honey is depleted, the spheres are retrieved and washed in water. The balls were extremely uneven. I had used an unfortunately large and hard to control pipette; for later experiments, I found a more appropriate one, with a small tip. The honey taste was extremely subtle; perhaps cutting down on the water would help. The only difference between the preparation of the ketchup and mustard was in the cooling stage; the ketchup was cooled in the same way as the honey; dropped from a pipette (more appropriately sized this time!) into freezer-chilled vegetable oil. The mustard, on the other hand, was fed into surgical tubing, which I then placed in ice water. After a few minutes I used a syringe to force air into one end of the tube, slowly forcing the mustard out the other, leaving behind a stringy spaghetti-like condiment that was so solid it could be picked up in your hands! I'm quite pleased with how this, my third experiment, turned out; still, there are many more left to be done! If you have any ideas, let me know! Today was a bit more relaxed than yesterday — I spent a few hours picking out food for the week, shopping (my first time at Ralph's, following Mike's suggestion), and cooking. 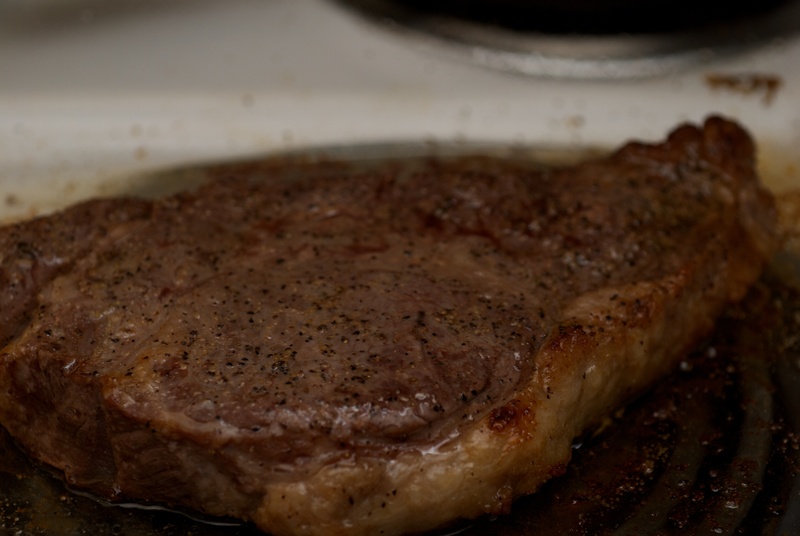 I made a pretty awesome broiled steak (there are grills downstairs, but that whole concept is way too scary for me! ), some potatoes (butter and rosemary), and Nigella's white chocolate mint mousse (which I love dearly and have made quite a few times). 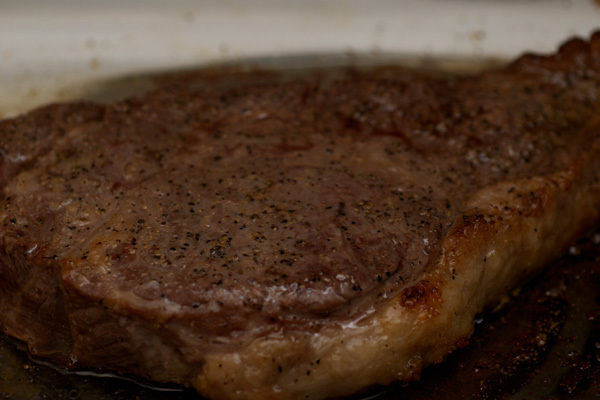 I've never tried to cook a fancy steak before, but I think it came out pretty well; less well-done than I usually prefer, but I was told that brown-insides and broiling don't go well (something about burning the edges), and I didn't mind, as it tasted great. I also got some of reddit's favorite dipping sauce, sriracha, and dipped some of the less-seasoned potatoes in that. It was... pretty hot. Dad would probably enjoy it immensely; I'm going to try cooking with it tomorrow and see how that goes — it will either be a huge disaster (my vote) or wonderful (the opinion of many people on the internet whom I have no reason to trust but go along with anyway). 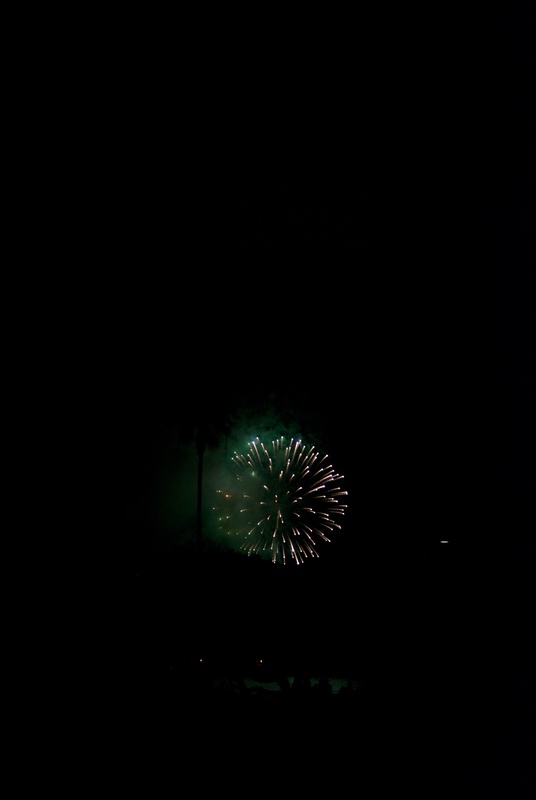 When I got there, the La Jolla Cove fireworks were just starting. All, in all, an average fireworks show, comparable to Burlington's — exciting mostly for the rarity, but I would have been sad had I missed it! Unfortunately, I didn't get any decent pictures of the fireworks, as I was sans-tripod and not in a great spot anyway... they're always better in real life! 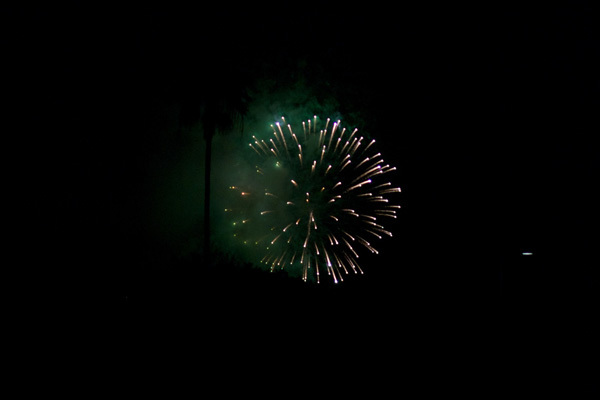 We were also treated to two other regional fireworks shows, running simultaneously with ours — one up on the hill just south of La Jolla Shores, and one over the ocean a bit northward. Being able to look around at different shows actually made today somewhat neat and unique, certainly more interesting than having a single set in the sky! I managed to catch the last bus home, just after the show ended, yay! No four mile walk in the dark for me! There are a few not-so-great-because-they're-taken-with-a-phone-but-whatever pictures over at Flickr. I'm leaving myself enough in the way of notes to be able to hopefully duplicate it in the future. The sauce was two jars of pasta sauce (some manner of garlic flavor) plus a pound and a half of ground beef, a pound of sweet italian sausage (cut into little slices), slices of onion, shredded fresh basil, and some parsley. The ricotta had garlic salt and parsley added to it, as well as one egg. The noodles are some manner of whole wheat variety, and I did cook them before construction (as Carol does, but apparently Mom does not). I left the top noodles naked, and they got crispy-but-not-too-crispy, leaving a nice topping. 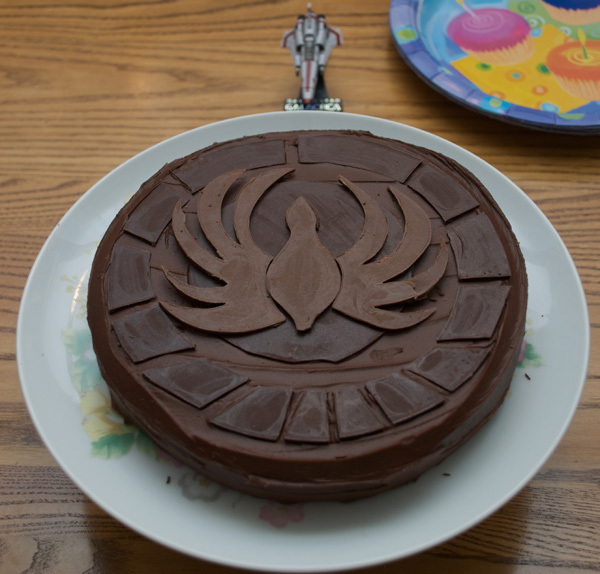 Amy made me a wonderful peanut butter and chocolate BSG cake. Also, this is post #100 here! We decided that, before Tim left to go back to school, we should make one more dinner. 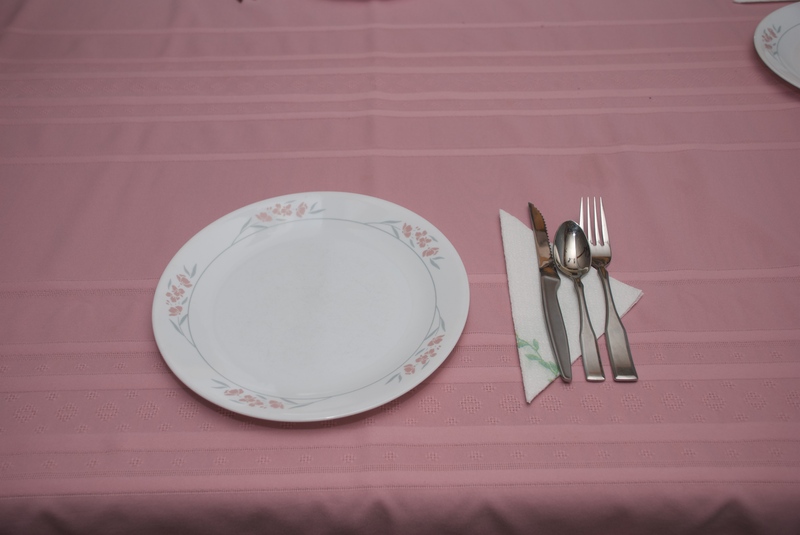 This time, on August 13th (almost a month after our last full meal), we decided to go all out—which means a table cloth, perfectly aligned settings and every course imaginable (except for soup...). 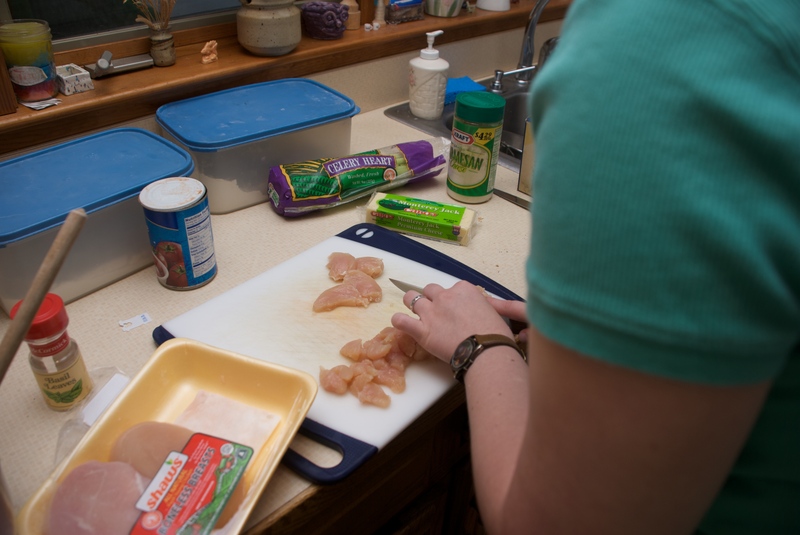 We decided to make a chicken and pasta bake, which I have made before with some friends at the Ronald McDonald House. In addition to that, we found a recipe for a spinach salad with sesame dressing. To our meal, we added dinner rolls and a mint tea punch. 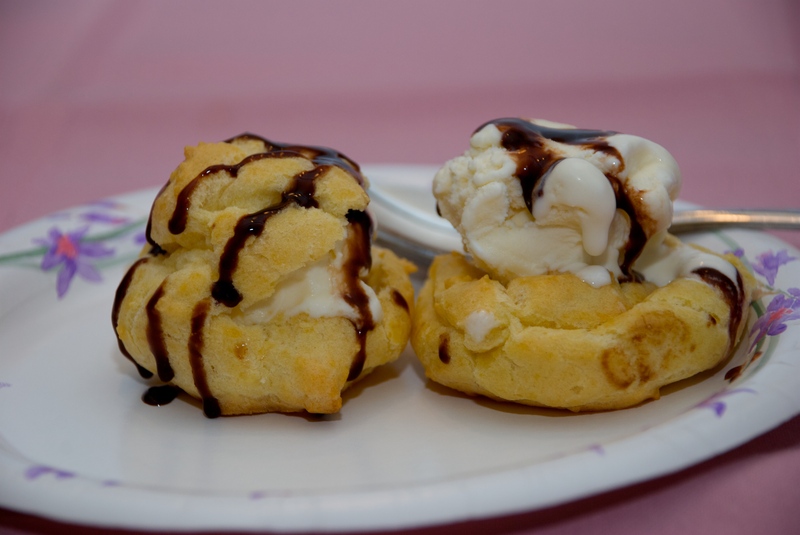 For dessert, we decided on profiteroles, which are basically cream puffs with ice cream instead of cream. We went shopping on the 12th, which is always an exciting adventure. We scouted out everything that we needed, except for lemon juice. We solved that issue by buying lemons and squeezing them ourselves. We even got to check ourselves out, which is always fun! I spent some time last night going through the recipes and organizing a timetable for when we should start each separate piece so that we could end up with a hot dinner at around 6:30. Today, we started at 4:00 with the rolls, because they had to rise. We mixed all of the ingredients (yeast, milk, flour, eggs, salt, shortening and sugar) in half quantities, so that we only had 12 rolls. 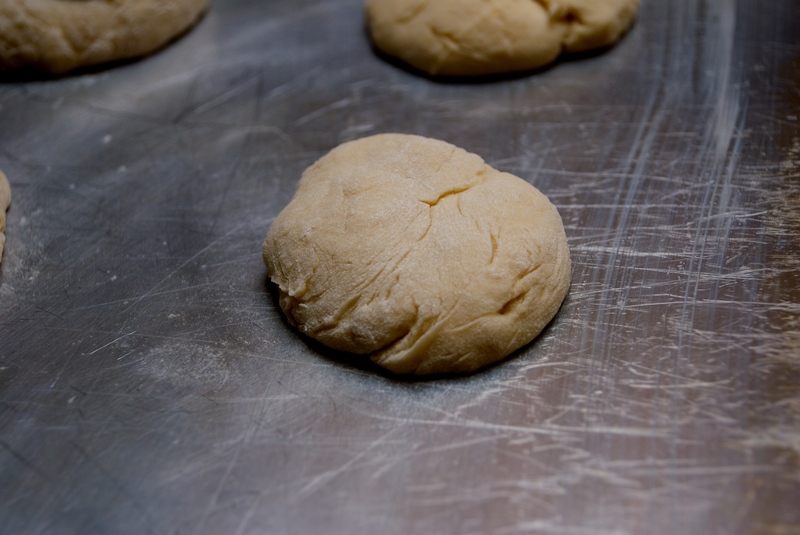 The next step was to knead the dough until it was smooth. That turned out to be the most exciting thing ever! Well, not really. 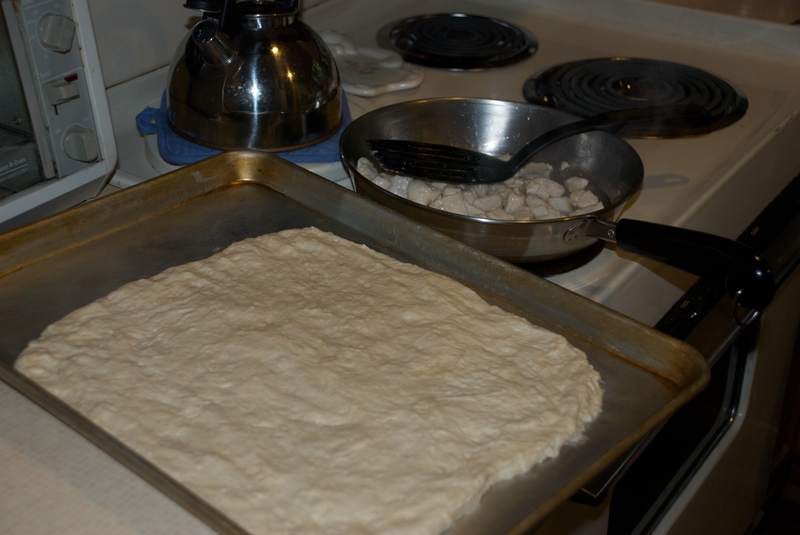 We floured the cutting board and plopped the dough down. Then Tim set to work kneading. 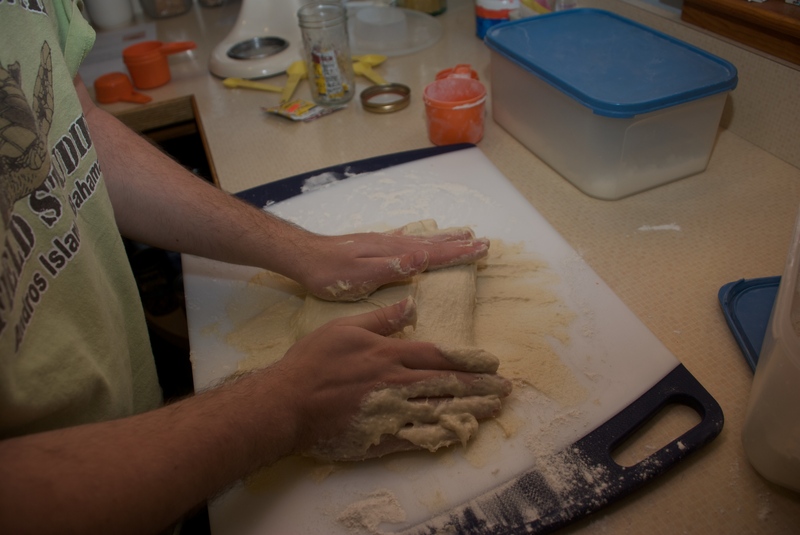 I poured (and I mean poured) flour onto the dough and his hands so that it would stop sticking. I can't say that it worked too well. 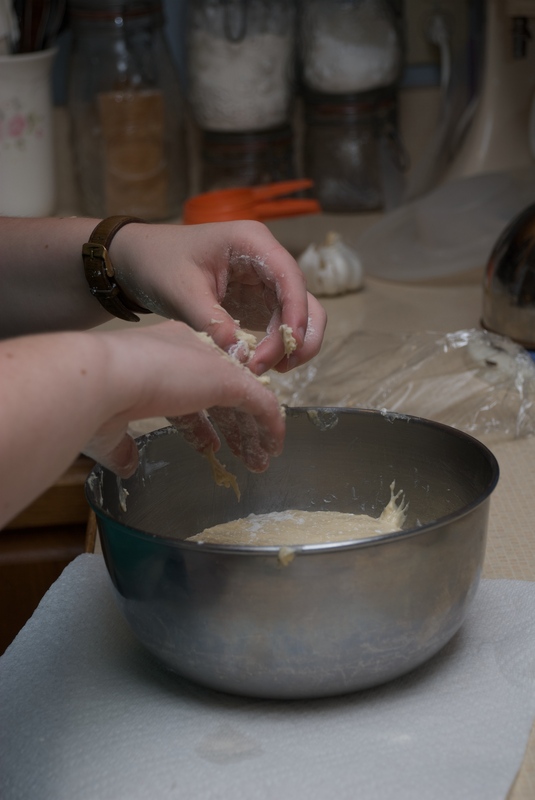 The dough was horribly sticky and messy, but we got it into the greased bowl and let it rise for an hour. While we were waiting, I did the dishes and Tim took some pictures. Before we knew it, it was time to start the main dish. 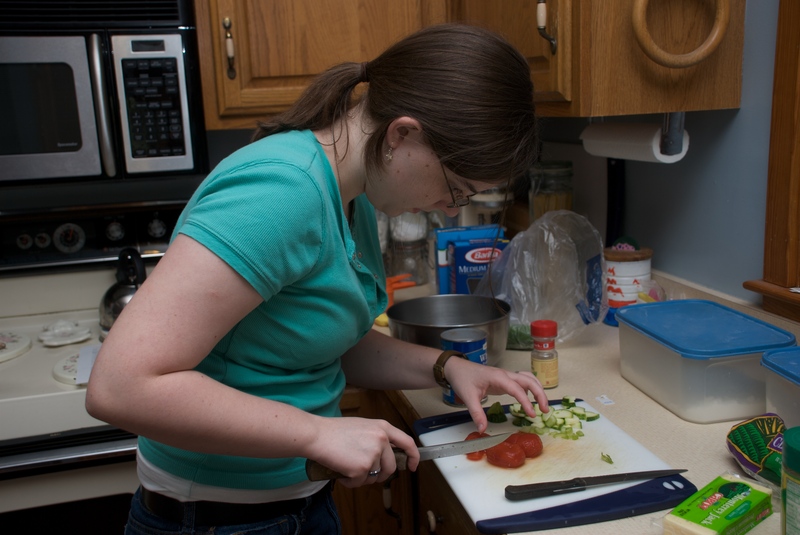 First, I cut up all of the vegetables and gave them to Tim to sauté. I continued to combine ingredients—the tomatoes and spices. 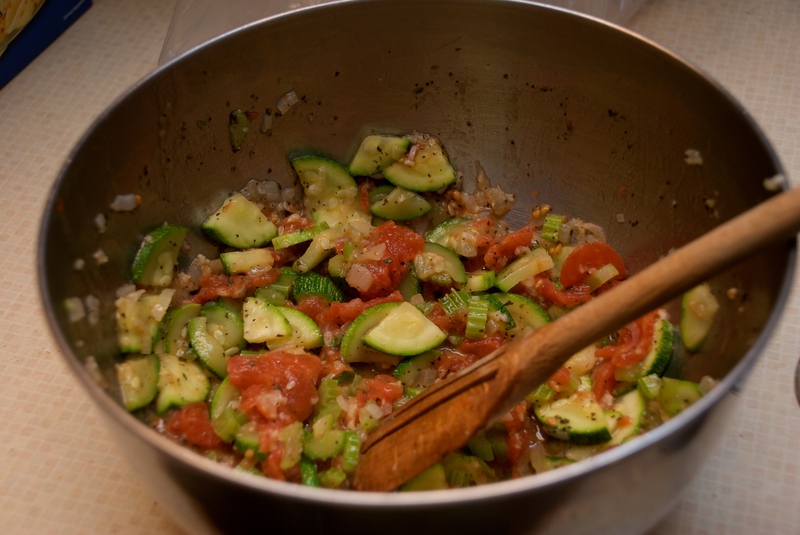 Then, when the vegetables were done, we added those to the tomatoes. Tim went off to cook the chicken which I cut up, and I set the pasta to cook. Those all finished in about ten minutes, and they too were added to the vegetables. Everything was mixed well and poured into a 13x9 pan. I shredded the monterey jack cheese and poured it into the whipping cream, while Tim measured the grated parmesan. All of that cooked over medium heat until it was a sauce. 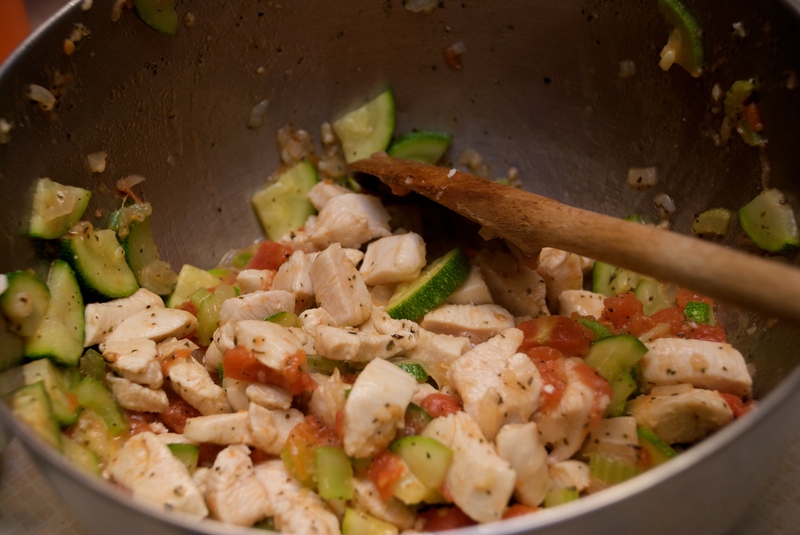 That was poured over the chicken/pasta/vegetable mixture. 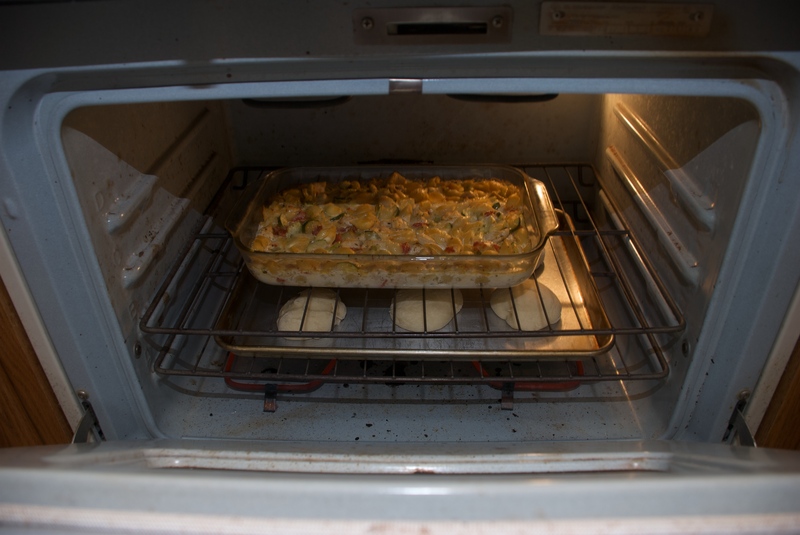 Then, we put into the oven to bake for 45 minutes. With that done, we moved back to the rolls. They had to be split into 12 pieces and put on a pan. I floured my hands and dove into the dough. 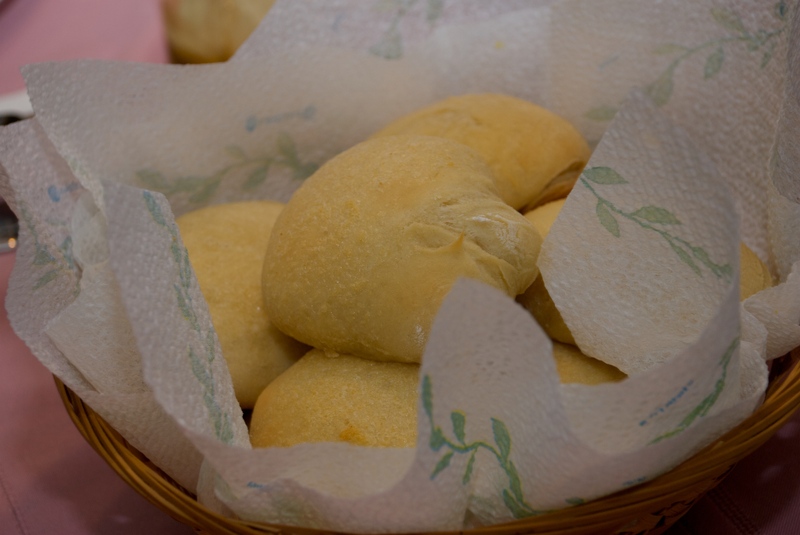 Eventually, with a lot of flour, the dough became 12 very round rolls. We put them in the oven with the chicken and pasta so that they would both be ready at the same time. Next came the drink. 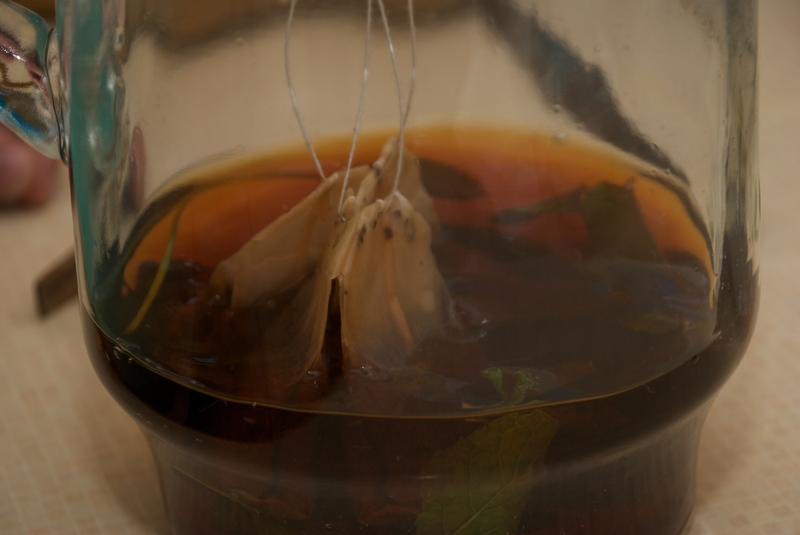 We boiled some water and put tea bags in it, as well as a bunch of mint sprigs. We let that steep, and then I took out the leaves and we added sugar and orange juice. We squeezed the three lemons and had exactly enough lemon juice to add. Then came the five cups of cold water. We put it in the fridge to cool, took out the chicken pasta bake and moved on to the salad. 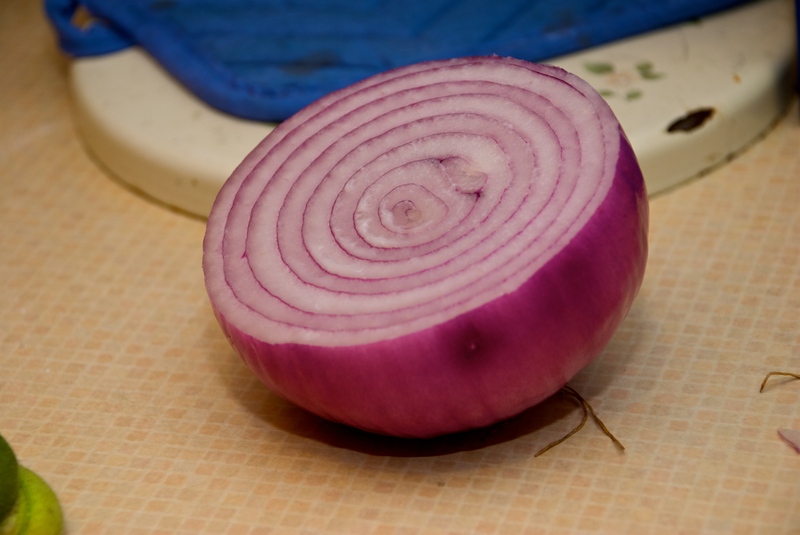 I mixed the spinach and red onion together and started on the dressing. 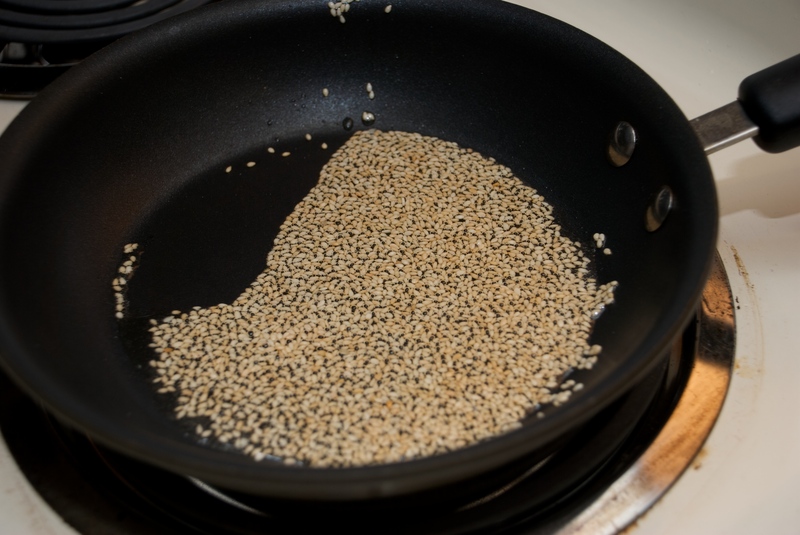 We cooked the sesame seeds and added the other ingredients (soy sauce, oil, salt, sugar and cider vinegar). Once it was boiling, which was quite dangerous, I poured it onto the salad and tossed it together. Tim was pouring melted butter and garlic salt over each roll (at which point I burned two fingers on the pans...) and letting them cook for another few minutes. Once that was done, they were taken out of the oven and put in a basket. Tim set the table perfectly and then we put everything on it. So, all of our food was done and on the table, and Mom was working her way through our mountain of dishes, but we were still waiting on Dad to get home from the neighbor's house. When he finally got home, we started dinner. So, for dessert we attempted to make profiteroles, which are, apparently, as hard to make as is it to say their name. It's really simple to make the batter and shape it on the trays, but once it's cooked, they 1) don't come off of the pan well and 2) don't fill well with ice cream because a) they don't cut in half and b) they fall apart. Basically, this was our first big... issue. I wouldn't say it was a disaster because how can you go wrong with ice cream? But it wasn't what it was supposed to be, which was very sad. Besides dessert, this was a very successful day of cooking! On July 19th, Tim and I made food for ourselves, while Mom and Dad were at the neighbor's house for dinner. We decided to make our own pizza which has apples, cheese, chicken and onions. Our first adventure was to make a crust for the pizza. Now, we're good at making pie crusts, but a pizza crust is a completely different thing. It turned out to be not as much trouble as people made it out to be, but trying to figure out how to cook it so that the crust didn't burn, but the top bits got cooked enough was interesting. Tim cooked the chicken (as always) and I cut up the apple and onions. We piled that on the semi-baked crust. Then we poured on the cheddar cheese and attempted to do the same with the pepper jack cheese. See, we couldn't find any shredded pepper jack, or a bar of it. So we bought slices. And then we had to shred it. We tried to use the large grater, but that failed. So Tim used the spinning hand held cheese grater—which worked perfectly. 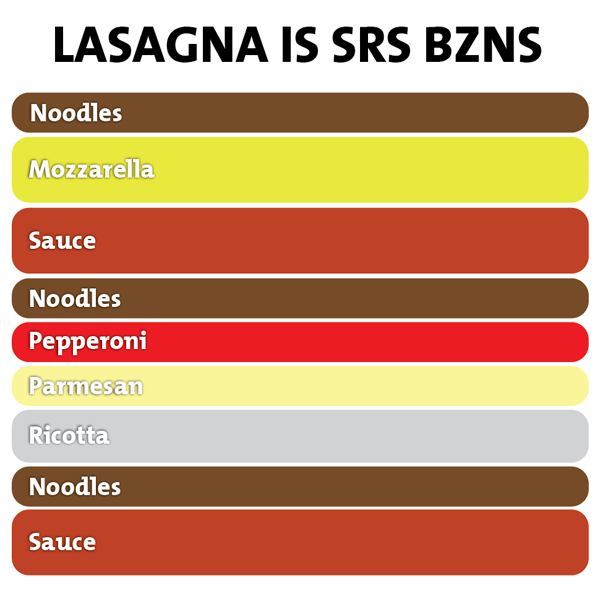 With all of our ingredients on the top, we put the pizza in to cook for another 10 minutes. When it came out, it was just browning and smelled great. The pizza was excellent. We cut it up in to 9 pieces, and had it for lunch the next day as well. It tasted great and was quite simple to make. 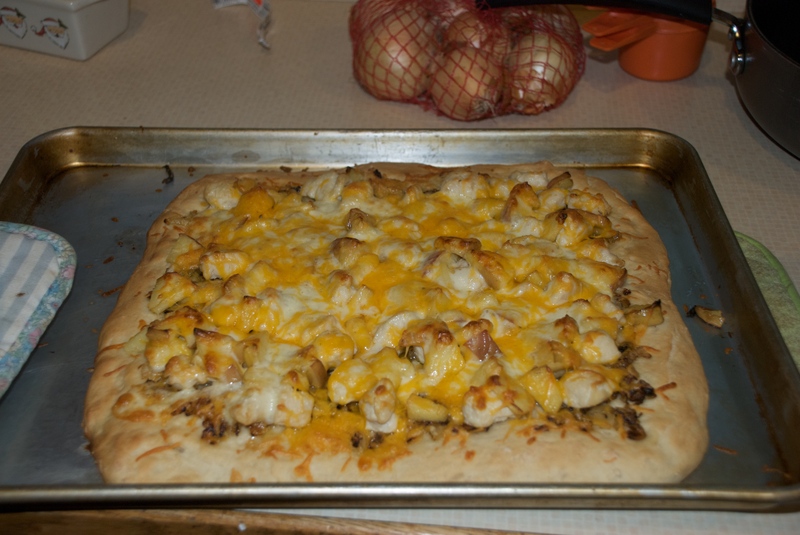 The crust worked extremely well and the apple/cheese combination is really good. 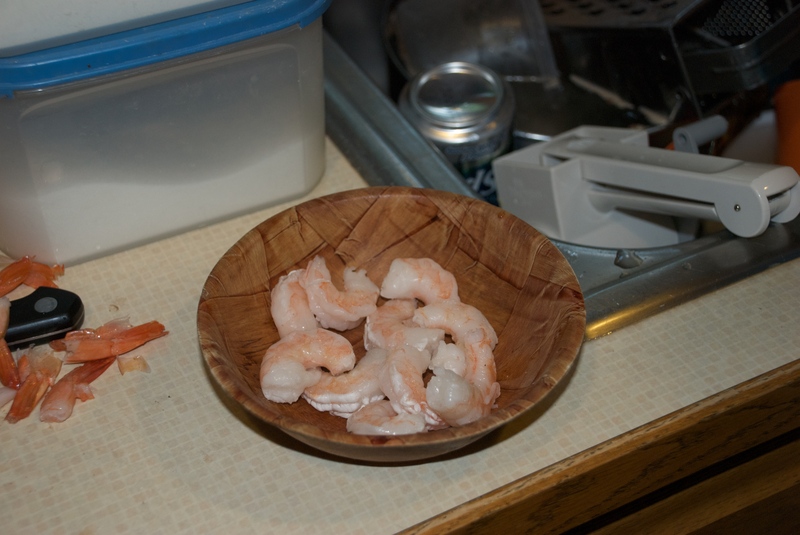 We had some frozen shrimp in the freezer that needed to be eaten, so Tim and I took that on as our next cooking challenge. 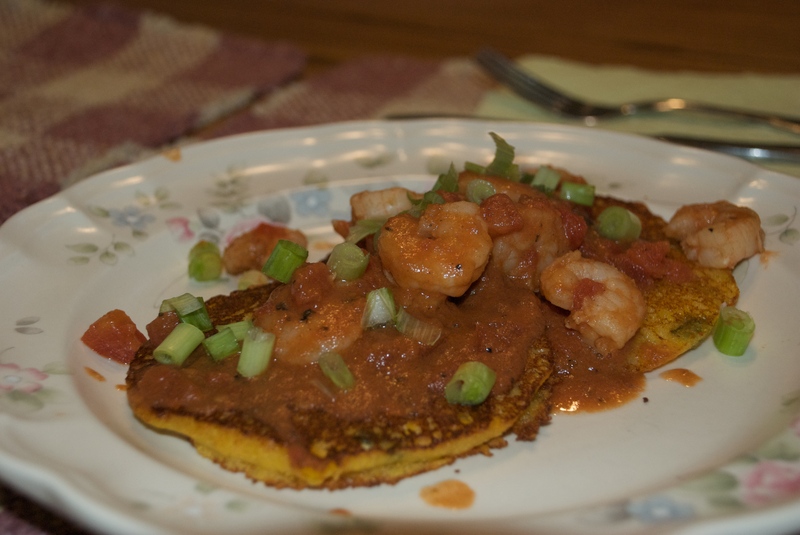 We found a recipe for Ancho Shrimp with Smoked Gouda Corncakes that would use up the shrimp, and be something other than chicken, which seems to be all we make. We also baked some chocolate white chip cookies and made a Orange Cream Punch as our drink. After searching for ancho peppers, ancho chile pepper or some spice that could be a substitute, we struck gold at Shaw's. 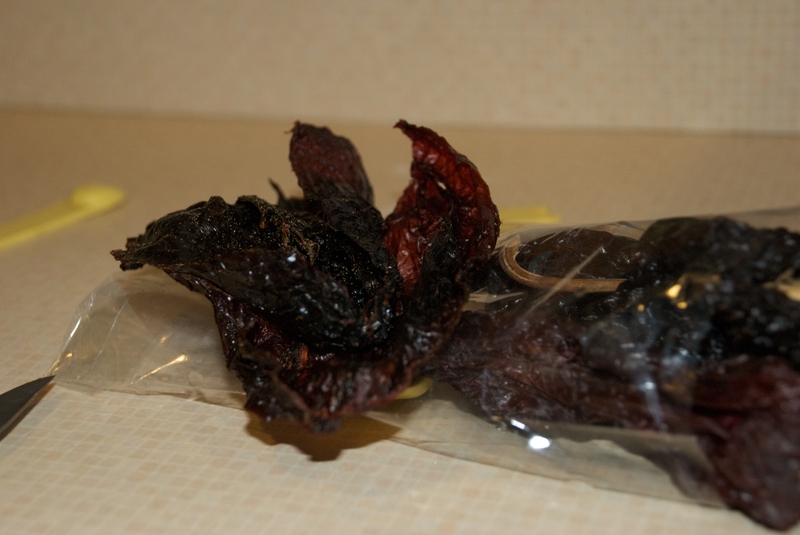 We walked into the store, picked up lettuce for salad and basically walked into the pepper section, which just happened to have dried ancho peppers. With that most important ingredient, we set to work. We started with our cookies, so that they could chill in the fridge because, apparently, that makes them better. We combined all of the ingredients, and even let Tim use the mixer—yikes! It was quite simple, besides the poofing chocolate and flour. 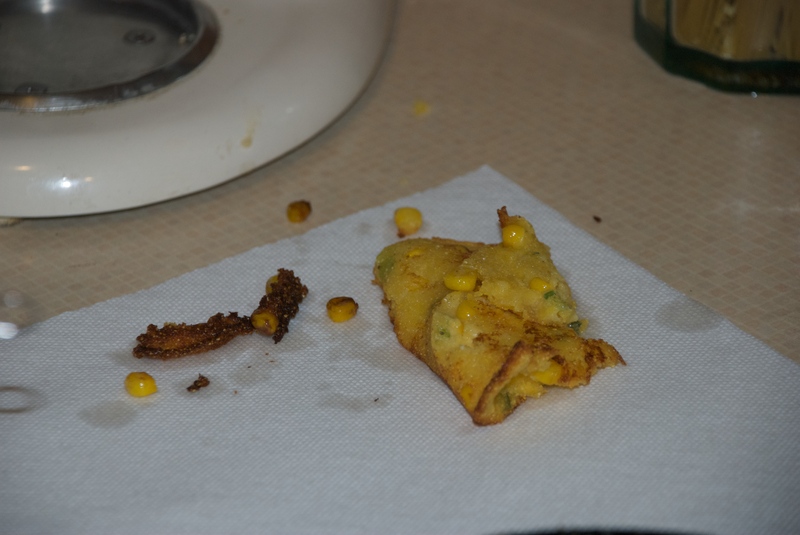 The first, and most important step in dinner was to make the corncakes that would accompany the shrimp. 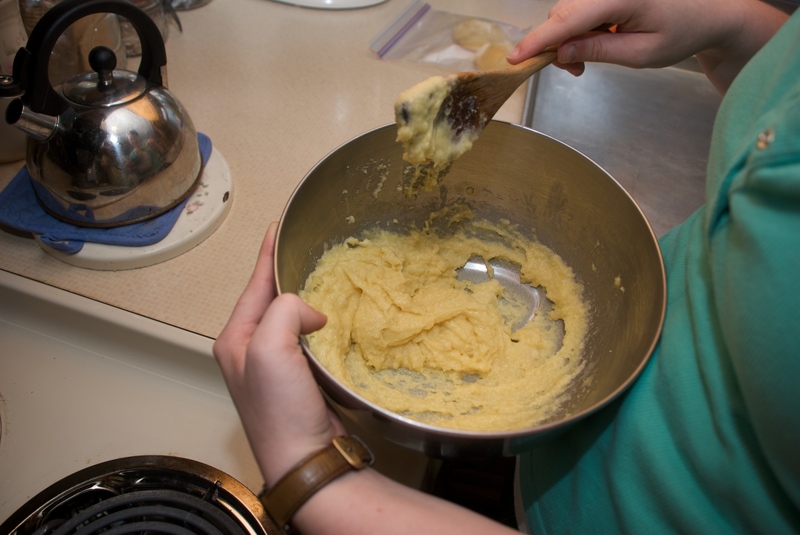 After mixing together all of the ingredients (and shredding our own Gouda cheese), I attempted to "spoon batter into oil by 1/4 cupfuls," but that really didn't work well. It was incredibly hard to know when the cakes were cooked, and how to flip them and just everything about them was painful. In addition, the corn was always exploding and releasing little spurts of hot oil, which always seemed to hit someone. So I gave that job to Tim, which may sound mean, but he did a really great job [ed. 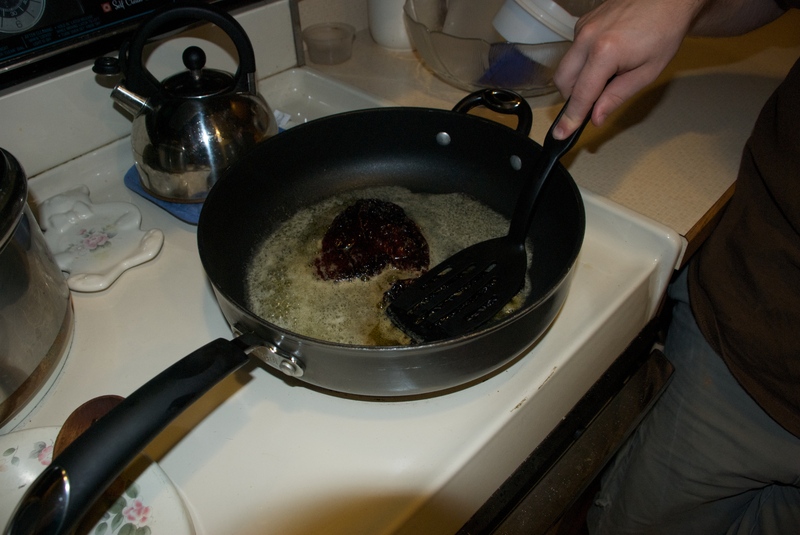 : lolno] making sure they were round and cooked. I was quite impressed. While he was doing that, I was de-tailing the shrimp and getting everything ready for making the shrimp sauce. 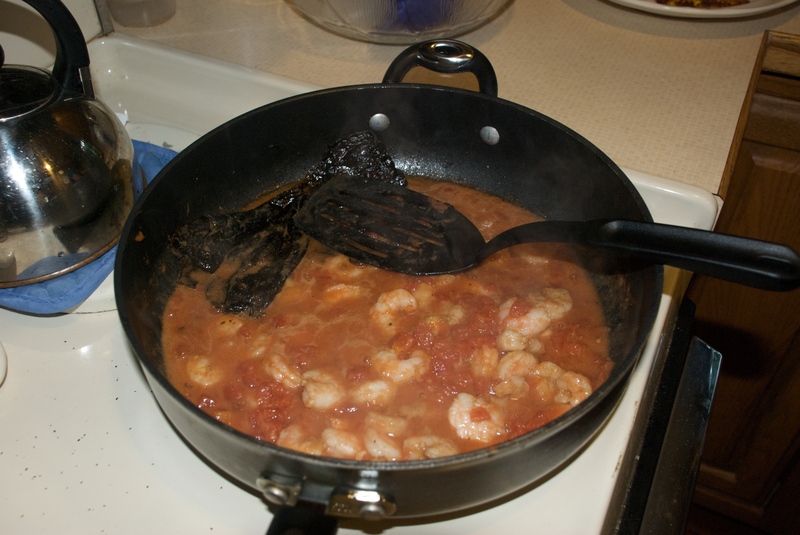 Once Tim was done, and I had done a set of dishes, we cooked the ancho peppers in butter. We let the oils, or whatever, seep out and we added the garlic. It smelled absolutely great—the ancho peppers had an "earthy" smell, and mixed with the garlic, it's difficult to explain. The shrimp was added—and it looked like we could have stopped there. But we added the tomatoes and it looked even better. 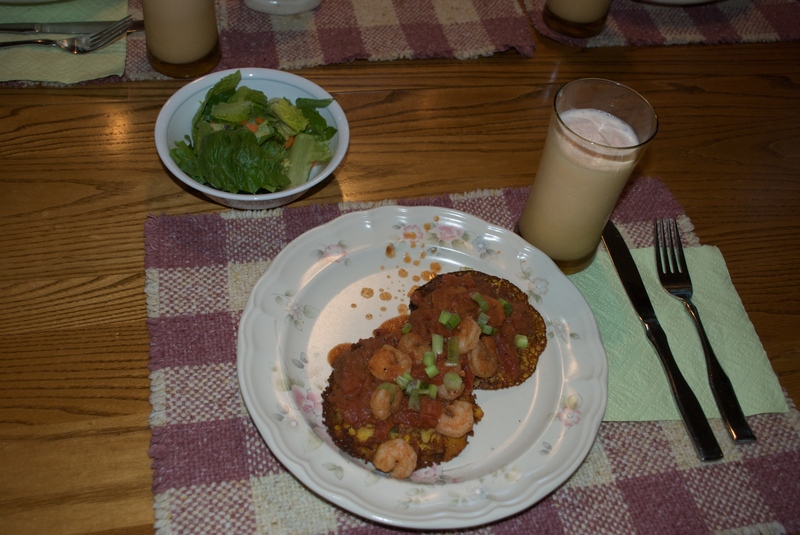 The peppers were removed, and we poured some of the shrimp and tomatoes over two corncakes on each plate. Our drink for the night was orange sherbet, vanilla ice cream, Sprite and milk. I combined it all in a big bowl, and it turned out to be smoothie-like. It was actually quite great, but it didn't really fit in with our dinner. After we ate, we cooked the cookies, which turned out to be very good. They didn't even burn—like the last chocolate cookies I made. In the end, a really awesome meal that was a little difficult in places, but well worth the effort. 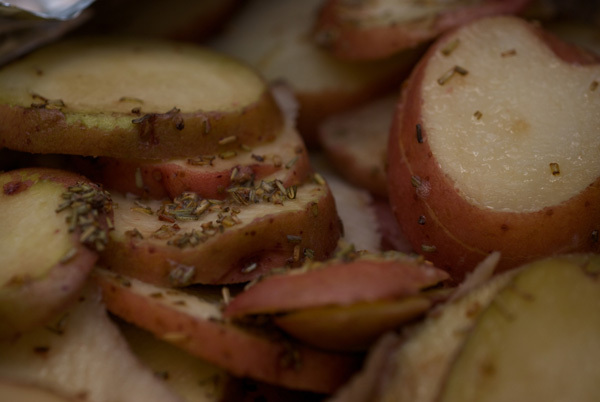 It was questionable along the way, in my opinion any way, but it turned out to be a good choice of recipes. 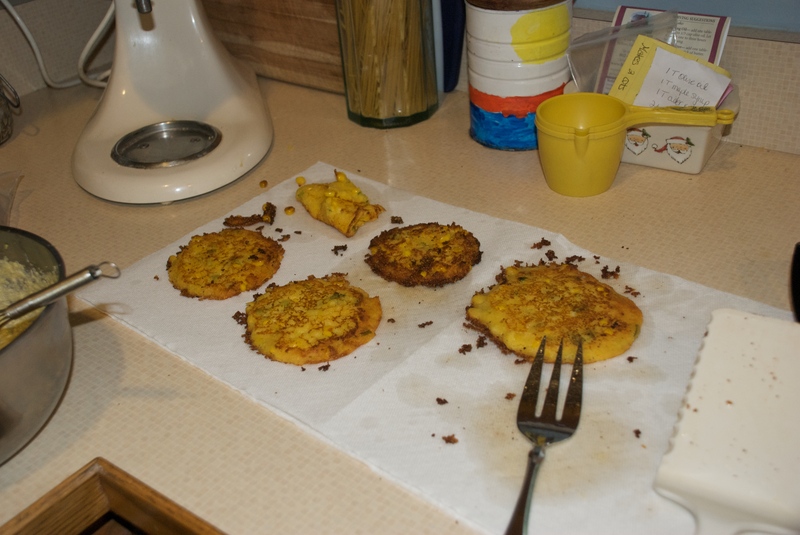 I think I would make all of these again, but maybe we should learn about corncakes and cooking things like that before we attempt it again—as that was very chaotic. Hello again! We made food again tonight, July 11th. I got this crazy idea to make chicken and rice stuffed peppers, which is what we decided to make tonight. In addition, we made buttery lemon spinach, an orange juice/lemonade/iced tea drink known as Tiger Tea and a brownie ice cream sandwich cake dessert. We started by making the dessert, because it took the longest and had to be frozen a few times. The first step was to make the brownie layers, which were easy to mix and bake. Those had to cool for a while, and then the ice cream center was added. It took a bit of effort to get the brownie out of one of the pans, which made everything a little more difficult. And the ice cream layer, which had to be level, was interesting because we had to slice the ice cream in layers, and had to keep melting it in the oven for a few seconds at a time. In the end, it was alright, the brownie part wasn't great, and it was really messy. Next, we mixed up the drink. It was made up of frozen lemonade and orange juice concentrate, water, sugar and tea. The drink was supposed to have two quarts of water, but we only had room in the pitcher for one, so it was a bit stronger, but it was still really good. Although it looked a little bit strange, it tasted better than we both expected. Then we started the peppers. We took the yellow peppers and cut holes in the top and removed all of the innards--that part was definitely not fun (I let Tim do that). I cut an onion which was torture, and Tim 'sautéed' them and we added that to some cheese, chicken, rice and spaghetti sauce. We spooned it into the peppers and let them cook, which confused us because we had already cooked the chicken. Oh, and a note on the recipe, if anyone decides to make it, a cup of cooked rice is not equivalent to a cup of raw rice, but it really works fine either way. The stuffed peppers were excellent, in all of our opinions. This was another thing that we would definitely make again. We might even try some different fillings since the pepper piece worked so well. 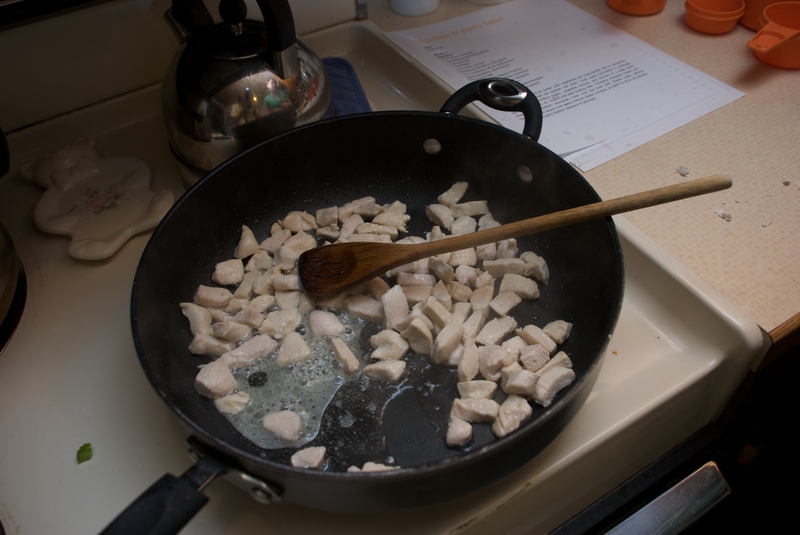 The chicken and rice worked great as well, but there are plenty of different things we could try. The spinach was spinach and some lemon juice, butter and oil. It was really simple to mix together and microwave for 2 minutes. It was easy, and alright in the end. Together, an excellent dinner—everything worked really well and tasted great! Most of these are things we would try again. There was a lot to be done, and it took longer than expected, but it was worth it in the end! Hi, Amy again, writing before we embark on our next fooding adventure tomorrow! 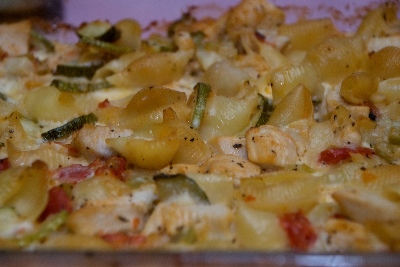 On June 28, Tim and I made an attempt at a classic Utica/Rome, NY recipe called chicken riggies. It's basically chicken and pasta (penne in our case, though rigatoni is suggested) in a creamy tomato sauce. It's kind of odd to think of and explain, but it was actually quite great. The most hilarious bit during cooking this was the sauce. When you let it settle, it turned white, but when you stirred it, it turned bright orange. Absolutely awesome. We skipped the cooking sherri, which was fine, but I think rigatoni would have been better. In addition, we made some cheese bread—simply a cut up loaf of Italian bread, buttered and spread with mozzarella cheese. Then the bread was baked it for about 3 minutes, and it was nice and warm and delicious. Our chocolate chip ice cream pie was excellent. 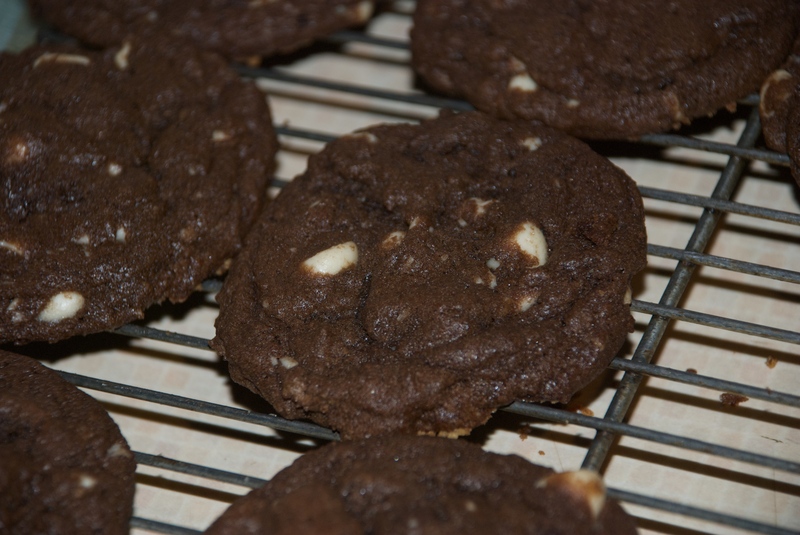 The crust, which I had to make again, was crushed mini chocolate chip cookies. There was a ring of cookies around the edge. The crust was covered in melted vanilla ice cream. We stopped there, and decided not to follow the next step which said to wait 2 hours, then add more ice cream. We just put a ton of ice cream on the first time and froze that. 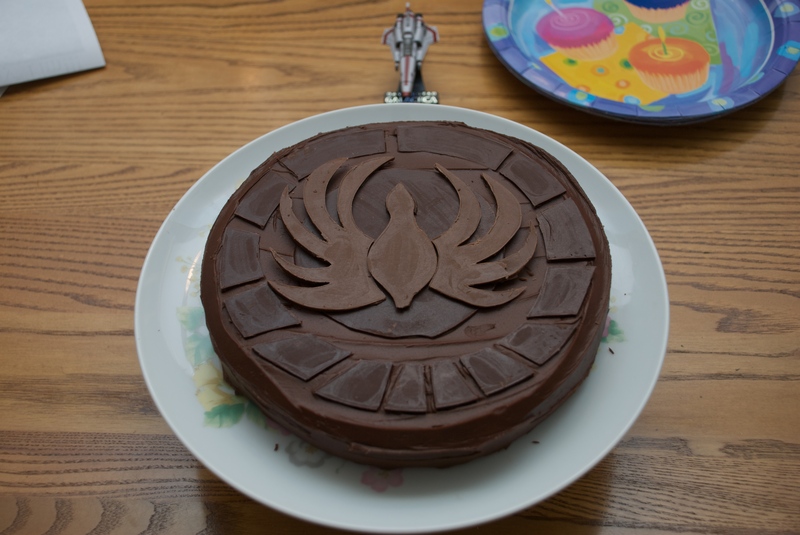 This was definitely a dessert we would make again! Overall, a very good dinner that was semi quick and simple. Hi, it's Amy again! 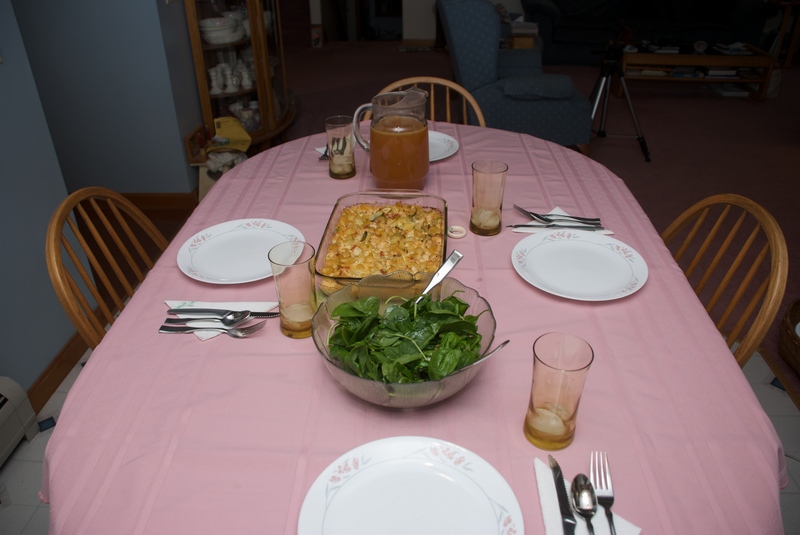 Our first attempt at making a full dinner together happened around June 17. After going through about a thousand recipes, I compiled a menu for a complete dinner. The main dish was called Southwestern Chicken Salad—a combination of salad, baked flour tortillas, chicken, corn, black beans and tomatoes. The dressing was a mix of barbeque sauce and ranch dressing. It was very simple and good for the most part, though the beans and tomatoes were rather excessive. The corn bread muffins we made from scratch came from this recipe. They were quick and easy, but we learned that you should use Pam, not muffin papers. Also, the recipe we used, which we found after we went shopping, used only things we already had. As for dessert, which is apparently what we're quite good at, we made banana cream pie. Yet again, I had to create a pie crust out of crushed graham crackers—which is never too fun. But, on the upside, I didn't have to whip cream. Instead of using two boxes of vanilla pudding, we had one vanilla and one banana. Mixing the two worked quite well since we only had one banana to slice. To complete dinner, we made Pink Honey Lemonade. This almost didn't happen because of the lack of strawberries and the excessive simmering that had to be done, but in the end, we got the strawberries and made it work. The lemonade tasted excellent once it was done, but a lot of work had to go into boiling the strawberries. And we sort of failed at the lemonade bit since we only had half the amount of lemon juice necessary. All together, it was a highly successful dinner that we pulled off in a good amount of time for all of the components. It would have been nearly impossible to get all of this done with only one person since a lot of things had to be done simultaneously.